Since the 1400s when it was referred to as the “Old Swiss Confederacy,” Switzerland has held annual Schützenfest festivals where contestants match their marksmanship skills in target shooting competitions. The first festivals were held with crossbows – the weapon that William Tell famously used to shoot an apple off his son’s head. In the 1800s, the weapons changed to rifles and the festival has continued through today. While various medals and cups were presented to the winners, special Swiss “Shooting Thalers” were issued to the general public from 1842-1939 to commemorate the event. They are distinguished from the shooting medals by their uniform size and temporary legal-tender status. Production of these special Thalers was suspended due to World War II, and the Shooting Thalers were not reintroduced until 1984. 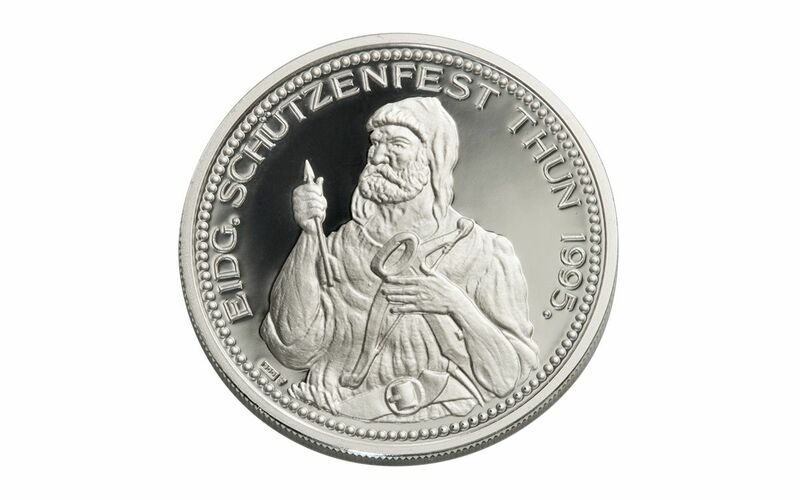 Now, you can obtain the 1995 silver proof that was issued to commemorate the Federal Festival in Thun. It displays a man loading his crossbow on the obverse and a castle on the reverse. Your 1995 Switzerland Shooting Festival Thaler – Thun Silver Proof comes in gorgeous Gem Proof condition, meaning it was expertly crafted by the mint from hand-selected planchets, polished dies and multiple strikes to produce beautifully frosted details rising over mirror-like fields! It will also arrive displayed in its original mint capsule. While the Swiss Shooting Thaler dates back nearly two hundred years, the history behind it goes even further back to the original shooting festivals, thus providing a connection with the past that few modern coins can match. The series has become increasingly popular in recent years, especially among collectors who have a passion for marksmanship. Despite their popularity, mintage numbers for Shooting Thalers remain extremely low, so order this 1995 Switzerland Shooting Festival Thaler – Thun Silver Proof at GovMint.com while you still can! 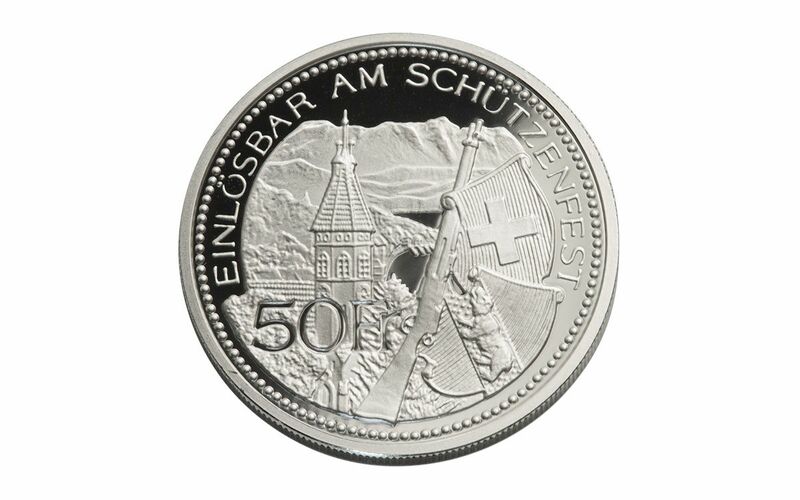 1995 DESIGN IN THE SHOOTING THALER SERIES – The 1995 Switzerland Shooting Festival Thaler – Thun Silver Proof features a man loading his crossbow on the obverse and a castle on the reverse. STRUCK IN PRECIOUS METAL – Your Thun Silver Proof was struck in 25 grams of 90% silver. UNIQUE FESTIVAL TENDER DENOMINATION – While this proof is not a legal-tender coin, it does bear a “Festival Value” making it technically redeemable for its face values. This 25-gram silver Proof has a face value of 50 Francs. GRADED IN GORGEOUS GEM PROOF CONDITION – Your 1995 Switzerland Shooting Festival Thaler – Thun Silver Proof comes in gorgeous Gem Proof condition, meaning it was expertly crafted by the mint from hand-selected planchets, polished dies and multiple strikes to produce beautifully frosted details rising over mirror-like fields! It will also arrive displayed in its original mint capsule. 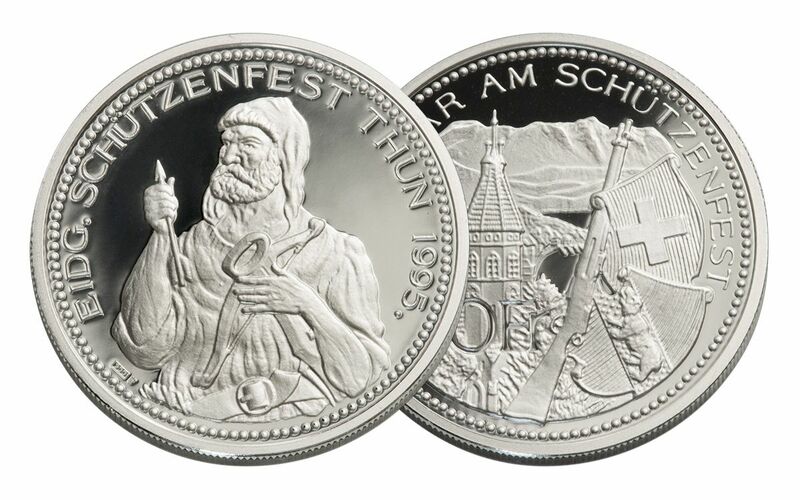 EXTREMELY LIMITED MINTAGE – The Thun Silver Proof is from a limited edition of just 5,000. Shooting Thalers sell out every year at the Swiss Mint, making these coins highly sought-after commodities in the secondary market.